In Africa, the elephant population has fallen by almost a third in recent times. Rhino poaching has also reached epidemic proportions with around 1200 rhinos being killed in 2014 and 2015 in South Africa alone. To combat the growing problem, methods to stop poachers have evolved and with the help of man's best friend they are taking them on from the sky. Meet Arrow, he is a two year old German Shepherd dog who has been specially trained to combat Africa’s poaching crisis. 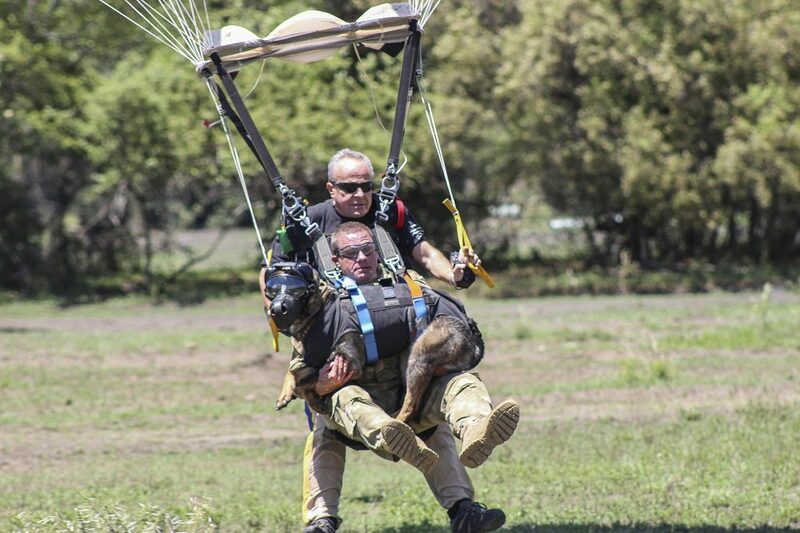 He has also just been recognised as the world’s first sky-diving anti-poaching dog by Guinness World Records after jumping at the Waterkloof Airforce Base on the outskirts of Pretoria. Arrow made his maiden jump with handler Henry Holsthyzen of Paramount Group’s Anti-Poaching and K9 Academy based in Rustenburg, South Africa. Specially selected as a puppy for his temperament and trained to descend from a helicopter by rope, strapped to his handler, Holsthyzen, and finally, to skydive. Arrow’s entry to the Guinness World Records family comes after much preparation. His skydiving expertise hinges on his close relationship with his handler. Since Arrow was a puppy the two have eaten, slept, and worked together in order to develop the inseparable bond needed to carry out high-pressure anti-poaching tasks together. Handler Henry Holsthyzen said: "With my knowledge of Arrow - knowing him, and knowing his personality - it gave me a very good idea of what to expect and he acted accordingly. He’s a natural born skydiver and an adrenaline junkie - I was more scared than he was! "I jumped out of the helicopter and it was just natural for him to follow me. I rely on him and in turn he relies on me. I’m willing to go into battle with him because I trust him. Trust forms the basis of our relationship and that enables the handler and the K9 relationship to excel." Arrow is one of nearly 200 other specially bred and trained K9s at the Anti-Poaching and Canine Training Academy run by Paramount Group, the African-based defence and aerospace company that manufactures aircraft, armoured vehicles, naval vessels and UAVs for governments around the world. The Paramount Anti-Poaching and K9 Academy is the culmination of six years of active involvement by the Ichikowitz Family Foundation and Paramount Group in anti-poaching initiatives, and is one of the largest of its kind in Africa. Speaking of the duo's success and their innovative approach to combating Africa's poaching problem with dogs, Eric Ichikowitz, Director of the Ichikowitz Family Foundation said: "In some cases we have to insert the canine into a difficult situation with the poachers or a challenging environment, such as a forest or mountainous regions. The parachute helps engage them quietly." "At any one stage we have a large number of K9’s at various stages of development enabling us to develop on each K9’s unique capabilities as identified and tracked from infancy through adolescence. The large pool enables us to select optimal pairings between handlers and dogs, and to experiment with combinations." He continued, "The training protocols have been developed through experience gained in operational environments, working in close conjunction with a number of National Parks special operations units. The training school is a custom developed anti-poaching facility developed to train anti-poaching rangers into specialised K9 handlers and to engage the handlers in the protocols of working with dogs in a wildlife environment." Through this initiative, Arrow and his canine comrades and handlers can react to poaching alerts within a moment’s notice combating and apprehending poachers to safeguard Africa's wildlife.